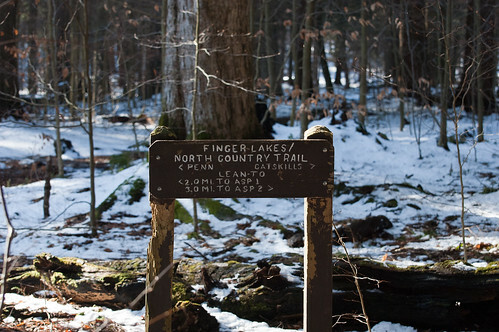 Took advantage of the continued mild winter and got a nice hike in over the weekend along the Conservation and part of the Finger Lakes/North Country Trail in Allegany State Park. The Conservation Trail is a 4+ mile loop that starts behind the Red House Administration Building. 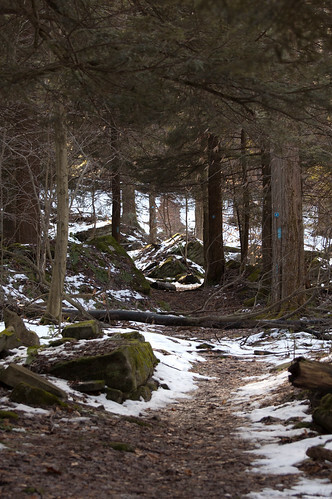 It’s a beautiful trail up the mountain, passing through several evergreen stands providing thick enough cover to provide a snow-free trail. 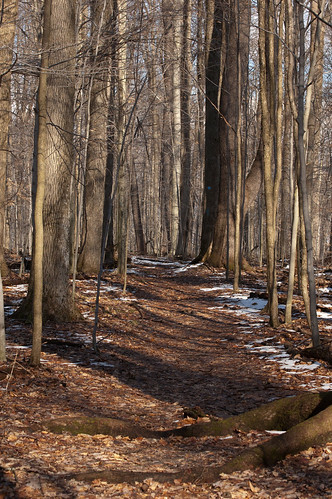 The less protected deciduous tree sections of the trail ranged from snow covered to muddy to sun-dried. There are numerous fallen trees to navigate and it seems the trail has not been cleared for many years, though it is well marked with blue, orange and white blazes (different legs of the trail are different colors). Birds we heard or saw along the way included chickadee, junco, downy woodpecker, white-breasted nuthatch, blue jay, and raven. We also saw numerous animal tracks in the snow that I will post next week – including one surprise for this time of year. 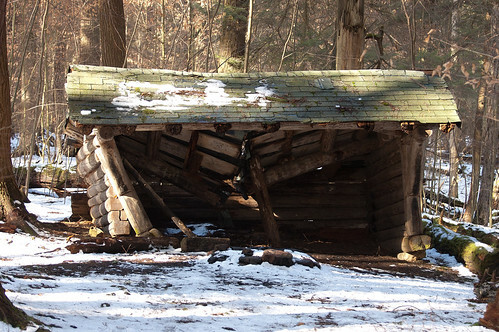 About 2 miles in you pass this old lean-to. 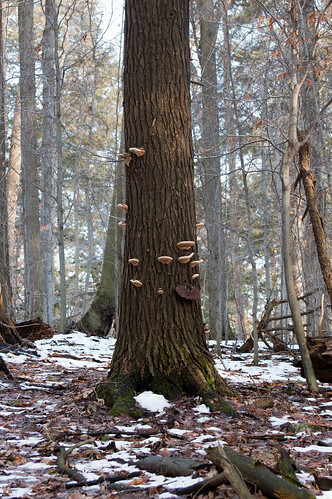 A new one has been built about ½ mile further along the North Country/Finger Lakes trail. 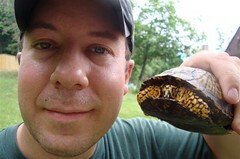 This entry was posted on 12 January 2012 by patacoate. It was filed under iPhone . Looks like a beautiful walk!! Reminds me of winters in Maine. Great photos. Love the site!